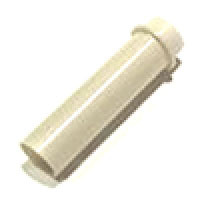 Plastic coil sleeve, 1-7/8 inches (47.6mm), with flange. Standard size flanged coil for use on devices where coil plunger goes all the way through the coil rather than hitting a coil stop. Used on devices such as vertical up-kickers, auto-launchers, kickback lane mechanisms, replay knockers, bell/chime coils, kickout scoops, and similar. Replacement for Bally/Williams # 03-7067, Stern # 545-5076-01, Gottlieb # A-6087, Stern # 4A-159, and many others. Always a good idea to replace the coil sleeve when rebuilding/servicing coil-driven mechanisms. Old worn sleeves can add friction to coil plungers and decrease performance. Restore that like-new feel and performance to your game with a few cheap coil sleeves! NOTE: No returns on Coils & Coil Parts - all sales final.